Celebrating the life of Noble Ollie James "Jay"
Be the first to share your favorite memory, photo or story of Noble. This memorial page is dedicated for family, friends and future generations to celebrate the life of their loved one. 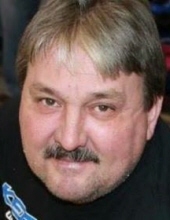 Obituary for Noble Ollie James "Jay"
Ollie James "Jay" Noble, 62, Jackson passed away Monday, January 21, at his residence. He was a retired coal miner. He was the son of the late Saul Noble and Millie Francis Noble Woods and the husband of the late Sandy Lynn Noble. He was also preceded in death by brother, Terence Gene Noble; sister, Catherine Noble; nephew, Nathaniel Haney. He is survived by one son, Brandon (Joy) Noble; one daughter, Taryn Noble (D.J. Caudill); two brothers, Saul Jr. (Judy) Noble, Henry Logan (Julie) Noble; four sisters, Ada Mae Noplis, Marlene Joyce (Doil) Haney, Gail (Ader) Roberts, Connie Sue (David) Combs; seven grandchildren, Branson Noble, Braeden Noble, Maddie Noble, Rachel Durham, Kylee Neace, Jaycee Caudill, Kaden Hall. Visitation, Wednesday, January 23, 6PM. Funeral Thursday, January 24, 1PM with Rev. Hirley Smith Jr. officiating. Burial in the Gilbert Cemetery at Highland. Serving as pallbearers, Shaun Noplis, Jason Roberts, Dustin Noble, Kasey Noble, David Combs, Neal Watkins, Matthew Watkins, Jason Jett, J.J. Lovins. To send flowers or a remembrance gift to the family of Noble Ollie James "Jay", please visit our Tribute Store. "Email Address" would like to share the life celebration of Noble Ollie James "Jay". Click on the "link" to go to share a favorite memory or leave a condolence message for the family.